Whether you are traveling by car, ship or plane, you will need a well-built pet crate that will serve to keep your pet safe and comfortable while traveling. Don't risk your pet escaping its crate. Get a quality, well built crate for your pet! 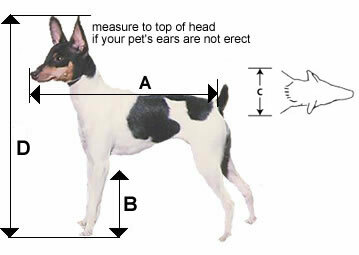 Measuring a pet can be difficult with a tape measure. We suggest that you use a piece of string, then measure the string after taking the measurement. Below are the interior measurements of the Petmate Sky Kennel crates which we carry in our store. These are some of the best crates made today for pets traveling in the cargo hold of an airplane. Their doors are strong and their ventilation openings are covered with wire bars to prevent your pet from escaping. Click on the crate size after determining the best crate for your cat or dog for more details. Is your dog an aggressive breed? Find information on metal dog crates. *Height extensions are available. Extensions for extra large crates. Extensions for giant crates.